The two Android Wear watches, the Q Wander and the Q Marshal, offer a smaller, sleeker take on last year’s Q Founder. The Q Wander seems to be the more feminine of the two, featuring a soft curving, sculpted wire lugs, and an interchangeable leather strap. The Q Marshal, according to Fossil, has a rugged case, a navy blue finish, and comes with either metal or “vintage-inspired” leather straps. Both devices will be available in 44mm and 46mm sizes. The watches will charge wirelessly and, being Android Wear, come with always-on touchscreen displays, notifications, information, etc. The face designs can also be customized with exclusive Fossil designs. 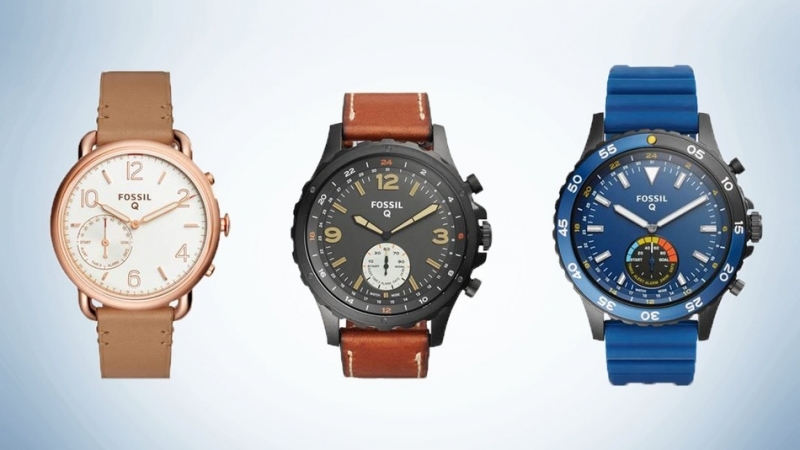 Fossil’s Smarter Analog watches, which are set to be released this fall, expands the company’s Q Grant line. Similar to the Tag Heuer Connected and the Breitling Exospace B55, these devices combine the looks and style of a traditional analog timepiece with certain connectivity features found in modern smartwatches. By connecting to an Android device or iPhone via Bluetooth, the smarter analog watches can alert you to incoming calls and notifications, as well as track your daily activities. They also feature automatic time zone updates, and can show a second time zone within the sub-eye on the analog dial. Finally, Fossil is introducing its latest generation of activity trackers – the Q Motion. In addition to tracking activities, these devices offer call and text notifications using haptic feedback and LED lights. The water resistant, bracelet-like trackers don’t need charging, but you will have to replace their button cell batteries every six months. The Q Marshal and Q Wander will be priced from $275 when released later this year; the Q Motion goes on sale this summer, with prices starting from $95. Prices for the smarter analog watches are not yet available.